A new resurfacing treatment that helps promote the production of collagen promises minimal downtime, minimal or no scarring and fantastic results. It can work especially well when it comes to the eye area, but can be used on the entire face. Most women know that the most tell-tale signs of ageing appear first and foremost around the eye area. Skin around the eyes is perhaps the most delicate skin on the face, and with age it can appear crepey and tired-looking. Luckily for those who want to appear younger than they really are, lots of remedies are available that can help make crepey skin look refreshed and rejuvenated, giving life to older faces – and older skin. One of these is the eMatrix Eyes Wide Open Treatment, which can make your tired eye area look younger and better and minimise the appearance of crow's feet in just ten minutes. It is based on a new concept of non-invasive cosmetic treatments called sublation, destroying some of the skin’s own tissues to enable it to heal itself. Gravity. As the skin ages, it begins to droop. In the old days a simple facelift was the easiest way to reverse this process, but not anymore. 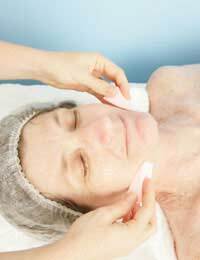 The tight, stretched look facelifts of yesteryear resulted in are no longer desirable. Sun Damage. Everyone wants to look healthy in their youth, and for many for us that meant a glowing, silky tan. Sadly, along with the threat of skin cancer, tans also mean long-lasting sun damage that can result in wrinkles and age spots. Smoking. Most of now know about the dangers of smoking, which can not only shorten our lives but also make us look a lot older than we really are. Environmental Factors. Harsh chemicals, bad weather, cheap make-up – all can wreak havoc on our skin. Dehydration. A severe loss of moisture can cause faces to age rapidly, as can rapid weight loss, which results in an immediate loss of volume. Age. If gravity hasn’t taken its toll already, there is a good chance that nature will leave an effect on your face in other ways. Your body no longer produces the same amount of collagen and elastic molecules it did in your youth, and sadly this is most reflected in your face. The eMatrix Eyes Wide Open treatment is relatively new, and it promises to deliver results with little downtime and little or no scarring. The treatment is available not only for eyes, but also for the full face, forehead and crepey necks. The concept behind it is simple. It delivers bi polar radio frequency energy to the selected area, which can be the eye area or the entire face. The radio frequency, or RF, will make a (painless) pattern of very tiny wounds on the skin. The idea behind the theory is that as the wounds heal, the natural healing process within the body is stimulated, thus resulting in new production of collagen.This collagen production, over a period of time, will make the affected area look tighter, smoother and more refreshed – in a nutshell, a lot younger. The eMatrix Eyes Wide Open Treatment takes only about ten minutes, although several sessions is recommended for maximum result. A topical anaesthetic cream is applied, and the patient should feel little discomfort. The treatment differs from a treatment using laser energy in that the development of new collagen can take place deeper within the skin, thus limiting damage to the skin. It is suitable for all skin types because of this, including darker skin. All eMatrix treatments are considered non-invasive, and are designed to fill the gap between more invasive treatments and those that are entirely non-aggressive with minimal benefits. The results, however, will not be immediately visible as it can take up to six weeks or more for collagen production to be evident. Your skin might also appear as if it has a mild sunburn immediately after treatment, a condition which can last for up to 48 hours. The eMatrix system can be “tuned” to fit the needs of individual patients and individual patient skin, as every person has different types of skin and thus different required outcomes. The skin resurfacing system is accomplished through the use of a hand-held device, which is easily portable. Make sure, however, that you only have this type of treatment – and any cosmetic treatment – carried out by someone who is Board-certified, and who has carried out the procedure countless times before. If you have tried laser resurfacing in the past with bad results, eMatrix could be the treatment for you. This non-laser resurfacing treatment doesn’t have the same risks of hyperpigmentation that laser treatments do, and can be done on a variety of skin colours. If you are looking to reduce the wrinkles around your eyes and make your entire face look younger and more refreshed, eMatrix could be the answer. It also works well on people who have sun damage, bad acne scarring and problematic facial skin texture.